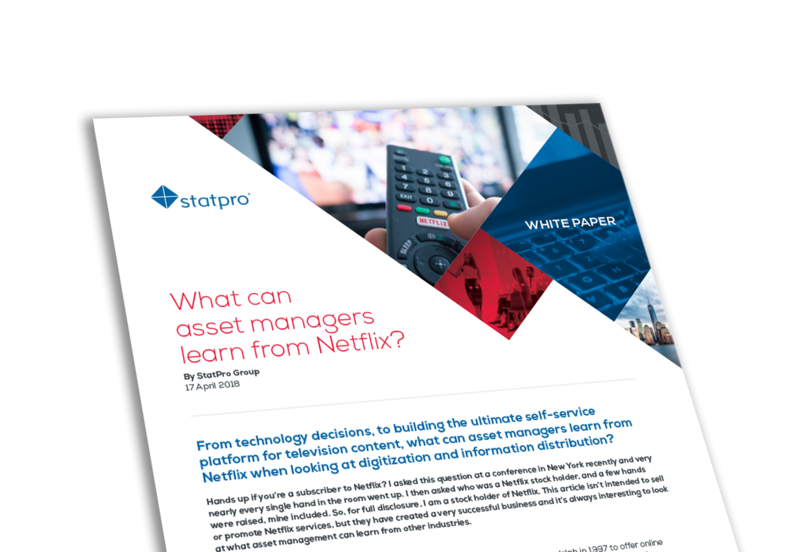 FROM TECHNOLOGY DECISIONS, TO BUILDING THE ULTIMATE SELF-SERVICE PLATFORM FOR TELEVISION CONTENT, WHAT CAN ASSET MANAGERS LEARN FROM NETFLIX WHEN LOOKING AT DIGITIZATION AND INFORMATION DISTRIBUTION? Hands up if you’re a subscriber to Netflix? I asked this question at a conference in New York recently and very nearly every single hand in the room went up. I then asked who was a Netflix stock holder, and a few hands were raised, mine included. So, for full disclosure, I am a stock holder of Netflix. This article isn’t intended to sell or promote Netflix services, but they have created a very successful business and it’s always interesting to look at what asset management can learn from other industries.